Numerous clients in the North Texas area and beyond rely on Protect Environmental Services to manage their chemical spills and waste disposal needs. 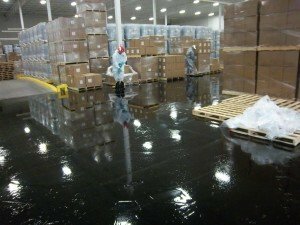 Large organizations such as defense contractors, manufacturers, chemical distributors, government entities and shipping companies have called Protect for almost twenty years to conduct spill containment and cleanup operations but small businesses that need our help receive the same level of dedicated service. Here are a few of the advantages of working with Protect when your organization faces a chemical incident. A call to Protect for an emergency response, day or night, means that trained personnel are on their way to meet the challenge. There are certain times that a chemical or fuel spill may be more likely to occur, but they can still happen at any time on any day. In most cases the spill quickly gets worse and when a spill reaches a storm drain or waterway, the cost to contain the spill and remove the contamination will rapidly grow. Because of this, Protect’s crews are always on standby for emergencies. Protect’s knowledgeable staff help your company stay in compliance with environmental regulations. Although there are certain rules at the federal level for the handling of chemical spills and contaminated waste disposal, individual states can create additional requirements of their own. The regulations can vary from one state to another so knowing the regulations that are applicable where the spill occurs can be vital. Failure to comply with the spill reporting and disposal requirements can mean major fines for the responsible party but our staff routinely works with the Texas Commission on Environmental Quality (TCEQ) and are familiar with how to conduct a cleanup in a way that meets all expectations. Protect knows safety. Hazardous materials are called hazardous for a reason. They can pose serious risk of injury or death if handled improperly. Employees working with these materials should be familiar with the risks and safety precautions but it’s especially important during an emergency situation. The exposure limits, conditions to avoid and the proper use of personal protective equipment all have to be considered when managing the release of hazardous materials. The staff at Protect take safety very seriously and in nineteen years we haven’t lost a single workday to an employee injury. Your problem is our problem. When a spill occurs, employees have to be evacuated from the area and machines are shut down. A company can lose hundreds or thousands of dollars an hour when there is a disruption to normal operations so restoring the area and resuming work becomes a priority. At Protect, we emphasize safety and urgency, meaning that when we begin an emergency response, we do everything we can so that our client’s operations can start again as soon as possible. 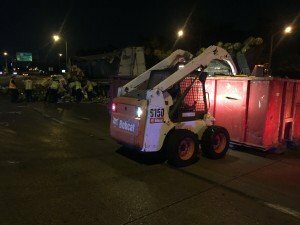 Even when commercial vehicles have accidents on public roadways and commuters are affected, we work hard to get lanes open and traffic flowing again. At Protect, we view HazMat response as more than just cleaning. We believe it takes integrity, knowledge, flexibility, dependable partners and dedicated employees to properly respond to potentially dangerous chemical and biological incidents. Our clients count on us when the stakes are high for them, the environment and the public. with our staff to develop a contingency plan that involves Protect Environmental. Calling today could make a major difference in how a spill affects your organization in the future.